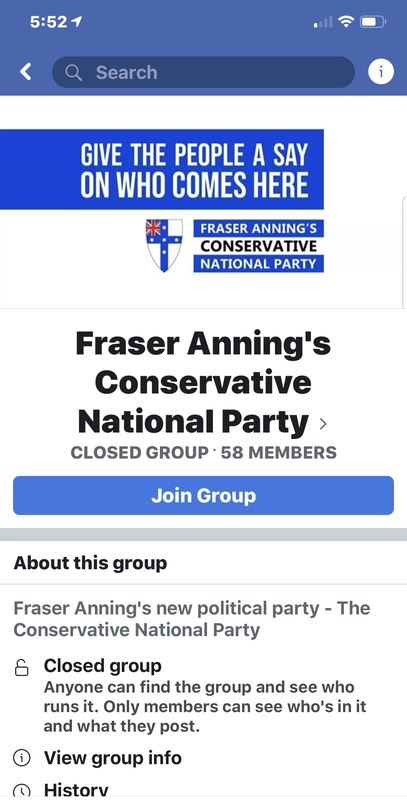 Last week a Facebook page was set up for Fraser Anning’s Conservative National Party. 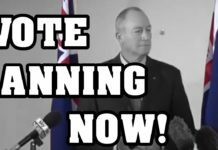 The proposed party is currently going through the submission phase with the Australian Electoral Commission. The XYZ published a brief article in which we linked to the Party Manifesto published on said Facebook page, and the page went from zero to nearly 10,000 likes in a week. 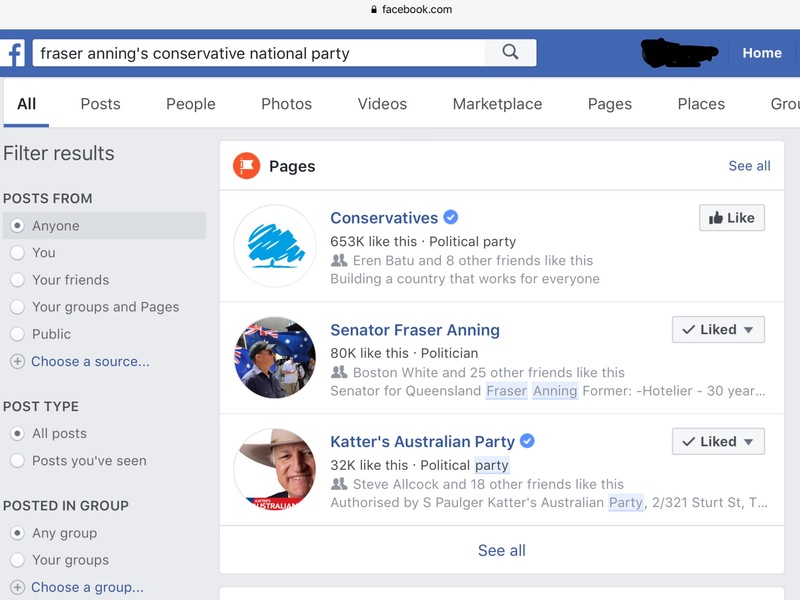 Facebook set a precedent last September when it removed Senator Fraser Anning’s official page – he became the first elected representative in a Western democracy to have their page deliberately unpublished by Facebook. If Facebook has indeed removed his Party page, it would continue Facebook’s pattern of censorship against conservative activists. “If so-called “platforms” like Facebook and Twitter want to dictate what opinions are or are not acceptable they need to take full responsibility for everything posted there. Silencing conservatives, nationalists and other non-Leftists but allowing far-Left terrorist organisations, like Antifa, is an explicit endorsement of those organisations. 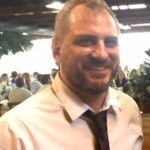 “Facebook need to be liable for the actions of far-Left pages or stop censoring people, and that includes algorithmically. If Facebook will not provide a free and unfettered platform for all political voices, it must be forced to by government regulation. This will eventually happen. Donald Trump is currently starving out the leftist swamp via the government shutdown, in order to get funding to build a wall to defend America’s borders. 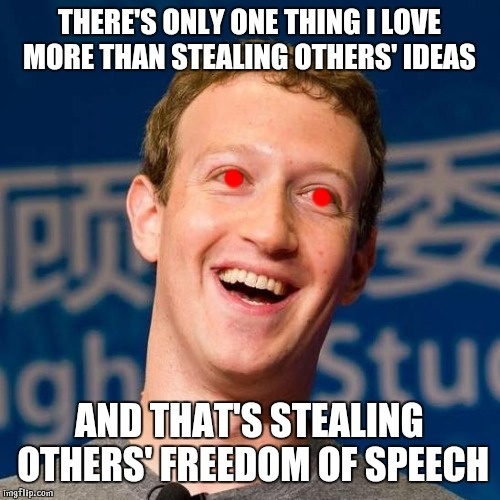 Once this battle is won, he will likely turn his attention to pressuring the globalists who own and run Big Social Media to stop censoring their opponents – ie, us. Once he does this, we will own the internet. Until then, people who love their country and their people in the US, Europe and Australia can still find ways to communicate, organise and amplify our message. The XYZ is on alternative social media platforms Gab and Minds, and we even communicate with our readers the old fashioned way – via email. We are now sending a newsletter each weekend. You can sign up to receive this by following the link to the right hand side of our homepage. And of course, there is always the pub. Keep calm and destroy the left. Never bend the knee to globohomo. This article celebrates diversity……of Vaginas….what next ? He’s not technically a cuck. That’s not what his Mrs told me last night. Jews aren’t cucks by definition. Cucks are whites…unfortunately. We should be more like Jews. No kidding. Don’t ask me to explain. You should know why. His Mrs is an ugly fat dragon lady Chinese boiling hen. Dragon likes to gobble big snake. This was also done to Bolsonaro during Brazil’s election. 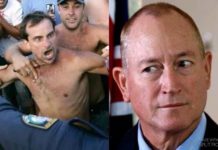 The US, Brazil and now Australia have the means and evidence to prosecute FB- but not the company, (like fining the banks), but go after the Directors and the CEO’s personally not the shareholders. Laying the criminality on the shoulders of the responsible individuals is the surest way to stop corporate crimes. It needs to happen but it won’t while the ruling class remain traitors. This is where corporate donations corrupt our democratic system. We pay political parties $2.73 per first preference vote garnered- CPI indexed 6 monthly. Why should companies be contributing to election campaigns? (Hint- buying political favour.) Personal donations should be capped at $10k. This flies in the face of why parties were given taxpayer funds per vote garnered in the first place. That’s the group, the page is gone. Down the Memory Hole. 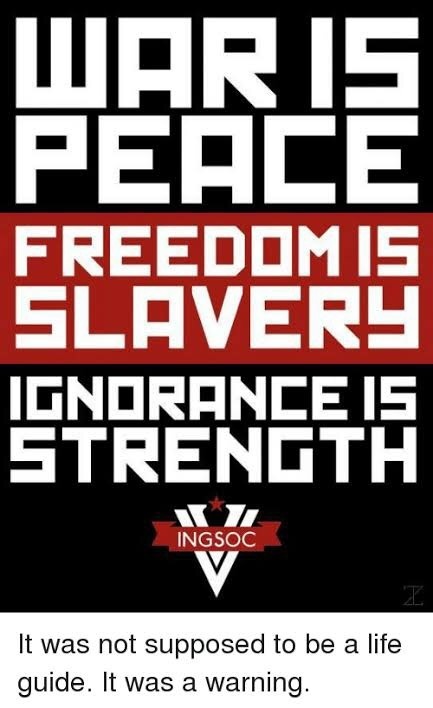 We live in the age of INGSOC, in Oceania. Ironically Antifa and the refugee advocates have adopted the INGSOC salute. Of course they did, Facebook are horrendous. They’d sooner start a losing war than let Nationalists speak their mind. Facebook also cancels accounts from people who report the crimes and connections of the billionaires-mafia. So does YouTube. They are controlled by the mafia. In the same way the UPF and Proud Boys pages were taken down, the feds would have had a direct link to Facebook offices to do this. 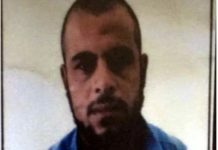 Same as that black fella who killed that Palestinian girl in Melbourne. Who made the decision to unperson him? 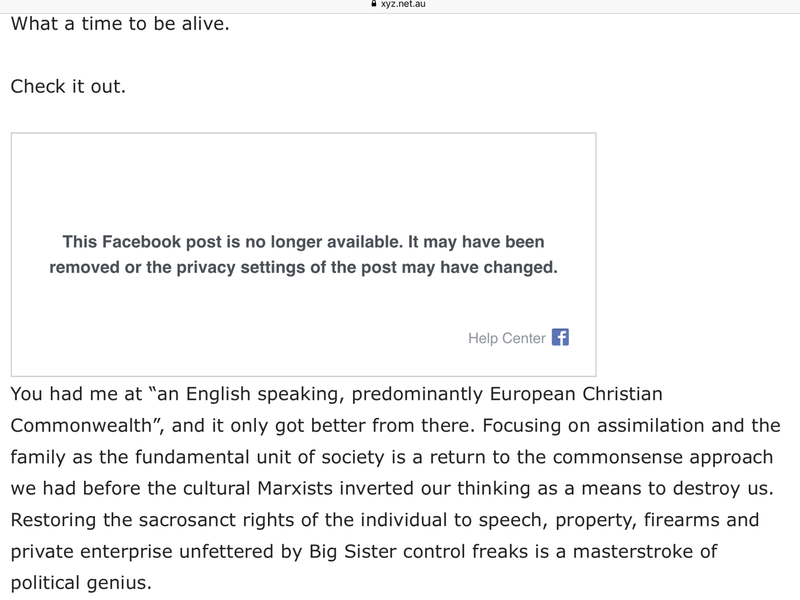 His FB / Party page is still down….his personal page is still up, with pretty much the same info as the CNP page that FB censored. Hardly surprising. Much of what was posted encouraged violence – the sort of stuff seen on toilet walls…..
Seen a lot of toilet walls have you? The page is back. The algorithm?